Lincoln talked of government “for the people, of the people, and by the people.” He didn’t say anything about too-big-to-fail banks. Starr contends that the government could have spent less money on A.I.G. — and therefore imposed less onerous terms on the company — had the bailout’s architects directed some of their tough love at the Goldmans and Deutsche Banks of the world. And Starr is hardly alone in making these claims. Ever since the details of the A.I.G. rescue entered the popular consciousness, everyone from members of Congress to financial commentators to Occupy Wall Street protesters and Tea Party activists have fulminated against the “backdoor bailout” of Goldman et al. By fully litigating the issue, the Starr trial may finally help heal this festering wound. At the heart of the controversy is the fact that the government has never provided a plausible explanation for why the Federal Reserve Bank of New York, which had enormous leverage over banks like Goldman thanks to its role as their regulator, didn’t lean on them to accept less than 100 cents on the dollar in their payouts from A.I.G. via Finally, the Truth About the A.I.G. Bailout – NYTimes.com. Canada, Belgium, and indeed the entire European Union seem to be organized on this basis. It’s not quite that everyone thinks they are getting their way, but rather explicit concessions are not demanded for each loss of control embodied in the broader system. Certain rights are held in reserve, with the expectation that they probably will not be exercised, but they can nonetheless influence the final bargaining equilibrium. Most international treaties rely on some degree of creative ambiguity, as do most central banks, with their semi-promises of bailouts but “not too much not too certain you know” as the default. You might like the mandated outcome (or not), but I doubt if it would improve political discourse in the United States to have an explicit thumbs up vs. thumbs down referendum on abortion. Many partnerships and marriages rely on creative ambiguity too. Should the Beatles have forced Lennon and McCartney to specify who had the final say over each cut? That probably would have led to a split in 1968 and there would be no Abbey Road. Must parties to a marriage specify the entire division of chores and responsibilities in advance? via Creative ambiguity, Scottish independence, and sudden death. Aka, what you don’t say may keep you whole. In essence, devolution is a way of enabling Scotland, Wales and Northern Ireland to have forms of self-government within the United Kingdom. The UK Parliament has conferred various sorts of legislative powers on the elected Scottish Parliament, National Assembly for Wales and Northern Ireland Assembly to do this. via Devolution: the basics | DEVOLUTION MATTERS. I grew up watching Groucho Marx on his “You Bet Your Life” television show. My father assured me that the Marx Brothers films were the funniest ever. But I didn’t get to see any of them until I went to The Johns Hopkins University, which had an excellent film series curated by Richard Macksey. Then I saw at least some of their feature films and laughed myself silly. My favorite, and certainly one of their best, is Duck Soup (1933). It’s about war between two minor nations, Freedonia and Sylvania, with the four brothers playing both sides of the conflict against the muddle. Groucho plays Rufus T. Firefly, who is installed as head of Freedonia by Mrs. Gloria Teasdale, played by Margaret Dumont, Groucho’s foil in several films. I won’t go into the absurd intricacies of the clap-trap plot as I’m interest in only one scene, the scene where war is finally declared between Freedonia and Sylvania. 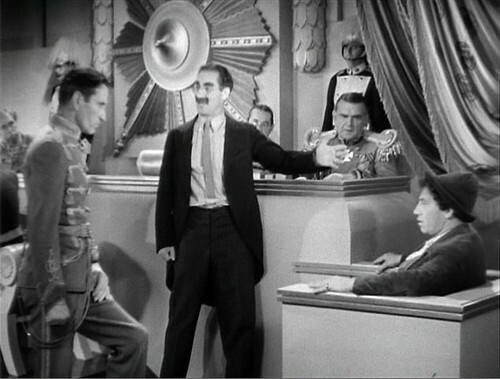 Chicolini (Chico Marx) is on trial in Freedonia for spying. Firefly has, for whatever reason, decided to act as his defense council, though he’s the one who caught Chicolini. This that and the other happens and the news comes that Sylvania troops are at the Freedonia’s border. This causes some distress as “war would mean a prohibitive increase in our taxes”—maybe back then, but not now; now we cut taxes and spend even more money on undeclared war. There’s some wordplay on “taxes” and “dollars” = “Dallas, Dallas, Texas.” It’s eerie, you’d think those guys were reading the future. I’m reproducing a set of notes I wrote up during the 2000 Presidential Election. I’m republishing them now in recognition of yet another turn in the long-spinning wheel of American mythology. Thus we have the thesis in Klinkner and Smith, The Unsteady March (U. Chicago, 1999). They argue that African Americans have been able to move forward on civil rights only during periods where the nation faced an external threat – the Revolutionary War, the Civil War, and the major wars of the first half of the 20th century. When the external danger had subsided, gains were lost. From my point of view, they’re arguing that, when external danger looms large and demands attention, the citizenry can focus aggression there and so ease up on the internal colony. Beyond this, of course, it becomes necessary to recruit from the colony to fight the external enemy, both physically and propagandistically – be kind to your black citizens when you fight the Nazis, etc. Between four and six possible answers to that question are provided, in the form of one page descriptions of a policy option. The participants divide into small groups, with each group advocating for one of the options. Each group’s aim is to win a vote. The vote is a preference vote – this form of voting encourages people who disagree to talk to each other constructively. Each group does this by explaining its option to the other groups, and, if it wishes, amending it, to make it more appealing, and even merging it with one or more others. via How to open up the debate on fracking | New Economics Foundation.